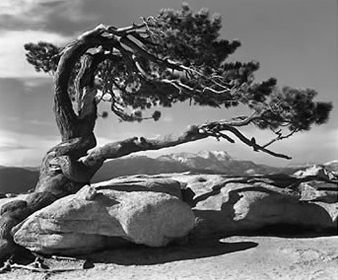 Jeffrey Pine, Sentinel Dome - 1940. Adams too this image with his 4" x 5" view camera. Today, the hike up the Mist Trail to Vernal Fall is short, accessible, and heavily trafficked. John Muir, in his book " …it is a favorite with most visitors, doubtless because it is more accessible than any other, more closely approached and better seen and heard. A good stairway ascends the cliff beside it and the level plateau at the head enables one to saunter safely along the edge of the river as it comes from Emerald Pool and to watch its waters, calmly bending over the brow of the precipice, in a sheet eighty feet wide, changing in color from green to purplish gray and white until dashed on a boulder talus." The Mist Trail is notoriously wet -- standing in the rain can be drier. Adams would have faced challenges keeping his equipment dry while capturing this familiar icon of Yosemite . If you want to take the picture and did not get there before 2003, when the tree finally fell over (it died during a drought in 1977), you're out of luck. However, people still flock to Sentinel Dome to take a photograph of this tree, I bet that It has since become one of the most photographed trees in the country. By the looks of the shadow, it looks like early evening..possibly just before sunset....or very early morning just after sunrise!